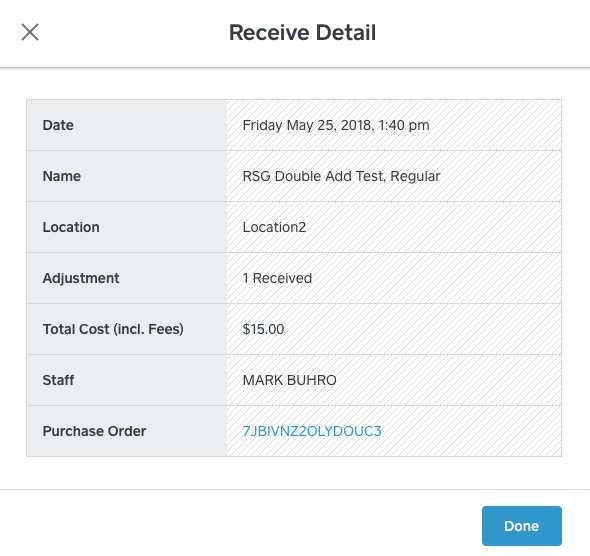 With Square for Retail’s Inventory Plus features, you can gain insights into the flow of your inventory by viewing historical adjustments. 1.From your online Square Dashboard, visit Items > Inventory Management > History. 2. Select a date range, location(s), and adjustment type from the dropdown menus to filter your search. You also have the option to narrow your search by product using the search field to the right. 3. Click on an event to see who made the adjustment, what it cost, and which locations were affected. In addition to your stock History log under the Inventory Management tab, you can review a summary of stock adjustments from your item library, for individual items. Head to your Item Library and select an item. In the Price and Inventory section of the item details page, click View Stock History. Review the stock adjustments and when you’re all set, click Done. Damaged: Items marked as damaged. Lost: Items marked as stolen (theft) or as a loss. Re-counted: A generic way to add or deduct stock levels. Received: If you receive a purchase order, or manually mark an item as received. Note: For an item to appear in the Cost of Goods Sold report, items must be marked as Received. Restocked: Adjustment will reflect as restocked when you process a return. Transferred: Record of transferring stock from one location to another. Read more about Inventory Plus. You can apply filters on your stock History log to view stock intake with an associated unit cost, without a unit cost, or all historical adjustments. If you need to update inventory without an associated unit cost, apply the filter Missing Cost. Navigate to Items> Inventory Management > History. Enter the unit cost > tap Save. If the original stock intake was with a purchase order, just click the link listed in the historical adjustment details page to update the associated unit cost. Note: Stock adjustments that deduct from your inventory levels will credit or debit your Cost of Goods Sold and Inventory Value (depending on the type of adjustment) based on a first in, first out (FIFO) accounting method. If the cost appears to be inaccurate, you can edit the cost of the original stock intake. As a result, you are unable to update the unit costs for adjustments that deduct from your stock levels — such as re-counts that adjust down, loss, damage, or theft stock adjustments. Let’s say you accepted a purchase order or manually received 10 items at a cost of $15 each. Later, you manually re-counted to reduce the item’s stock to 8 items. The re-count adjustment will debit your Cost of Goods Sold and credit your Inventory Value by $30. The adjustment will show in your History, but to update the unit cost (say to $10), you’ll need to locate the original receive adjustment. After you update the original intake adjustment, the re-count adjustment will automatically reflect the new unit cost and Inventory Reports will be updated. 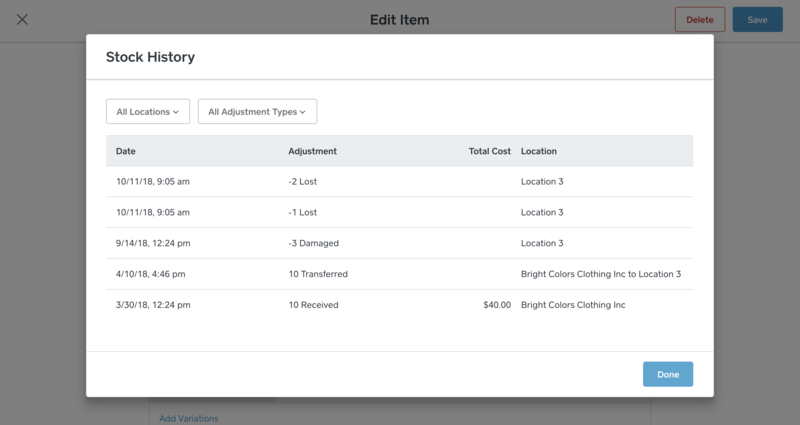 For items with a cost associated at the variation level, you’ll see the option to Resolve Unit Costs for adjustments in your History. 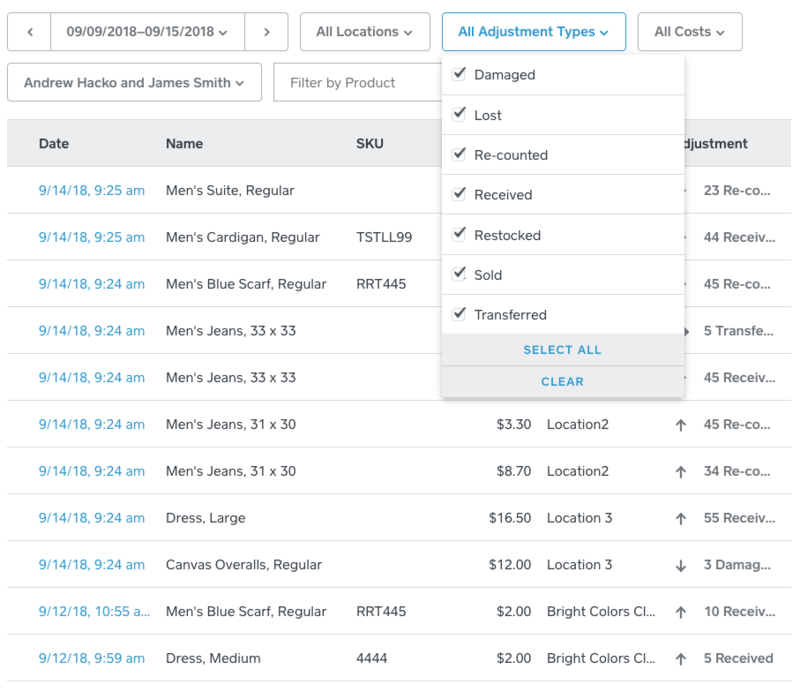 Keep in mind, if an item in your library is missing a unit cost, you’ll need to update each variation before you can bulk resolve missing costs from your History log. Log into the item library in your online Square Dashboard to confirm each item variation has an associated unit cost. Navigate to Inventory Management and click History. Select Resolve Unit Costs > Resolve Costs. When you select See Stock Actions, you’ll see each historical adjustment missing an associated unit cost. When you update one historical adjustment, the unit cost for every other adjustment will reflect the new unit cost for that particular item. You are not able to bulk update the unit cost for item variations you’ve deleted from your item library. To update historical adjustments for a deleted variation, you’ll need to update each variation unit cost from your History log. Review answers to frequently asked questions about Square for Retail reporting.